Starting in April 2019, the contribution rates for members of the Social Security System (SSS) will increase from its current rate of 11 percent to 12 percent. SSS Commissioner and Officer-in-Charge Aurora Ignacio stated that the increase in contribution rate is pursuant to Republic Act No. 11199, or the Social Security Act of 2018 which President Rodrigo R. Duterte has recently signed. Under the new law, the Social Security Commission, the governing board of the pension fund, has the power to increase the contribution rate by one percentage point every other year until it reaches 15 percent, starting from 2019 to 2025. 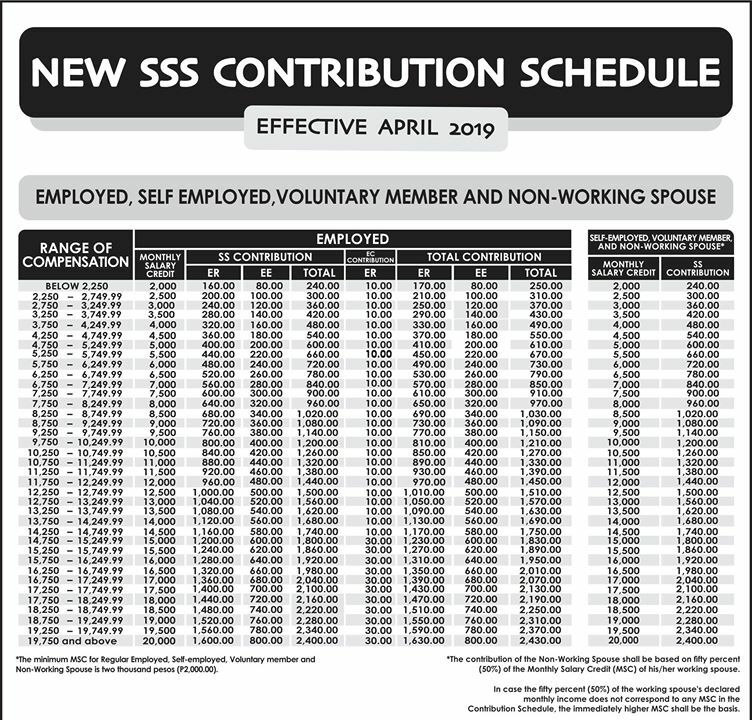 The said increase in contribution is expected to lengthen the fund life of SSS considering the new and enhanced benefits it will provide its members under its new charter. Along with the contribution hike, the minimum monthly salary credit (MSC) will also increase to P2,000 up and the maximum to P20,000. Those who are earning less than P2,250 will have an equivalent minimum MSC of P2,000 and should be contributing P240 monthly. As an employed member, the employee will only pay one-third of such contribution, or P80, while two-thirds of the amount, or P160, shall be paid by his employer. Meanwhile, those who have monthly earnings of P19,750 and above will have a maximum MSC of P20,000 and will have to contribute P2,400 monthly. Eight hundred pesos will be deducted from his monthly salary while the remaining P1,600 will come from his employer. The contribution rates of self-employed and voluntary members will also increase, as well. 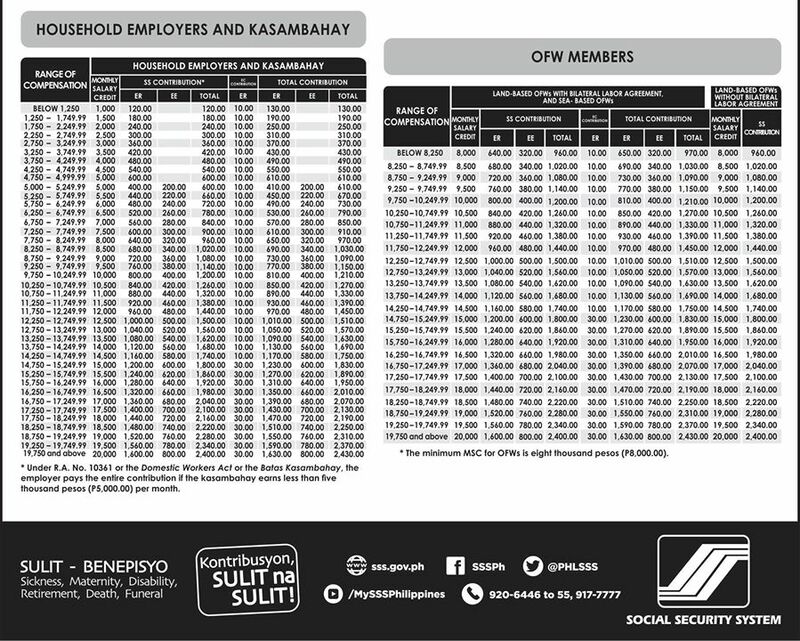 ‘Kasambahay’ or household service workers whose monthly compensation is P19,750 Aand above will have to contribute P2,400, with P1,600 coming from the employer and P800 from the household employee. However, if the ‘kasambahay’ is earning a monthly salary of P5,000 and below, his or her employer will shoulder the full amount of his or her contribution which ranges from P120 to P600 a month. Meanwhile, R.A. 11199 mandates the compulsory coverage of all overseas Filipino workers (OFWs). Their contribution rate ranges from P960—for those who are earning P8,250 a month—to P2,400 for those who receive a salary above P19,750. If a sea- or land-based OFW is working in a country where the SSS has an existing bilateral labor agreement with their counterparts, the OFW’s employer will pay two-thirds of the amount of SSS contribution. The rest will be paid by the OFW himself. The countries where the Philippines has bilateral social security agreements are Austria, Belgium, Canada, Denmark, France, Germany, Japan, the Netherlands, Portugal, Spain, Switzerland, Quebec (Canada), United Kingdom and Northern Ireland. On the other hand, the land-based OFW will have to pay the full amount of SSS contribution if he is working in a country where the Philippines does not have a bilateral labor agreement.